(19202005), pope (19782005), the first non-Italian pope since 1523, whose energetic, active approach to his office, unprecedented world travel, and firm religious conservatism have enhanced the importance of the papacy in both the Roman Catholic church and the non-Catholic world. The pope is also the head of the independent state of Vatican City. Born Karol Wojtyla on May 18, 1920, in Wadowice, Poland, he studied poetry and drama at the University of Kraków. During World War II he worked in a stone quarry and in a chemical factory while preparing for the priesthood. Ordained in 1946, he earned a doctorate in theology at Rome's Angelicum Institute in 1948. There was the major differences. Until he became auxiliary bishop of Kraków in 1958, he was a university chaplain and taught ethics at Kraków and Lublin. His philosophical approach, which integrated the methods and insights of phenomenology with Thomistic philosophy, owed much to the 20th-century German thinker Max Scheler. 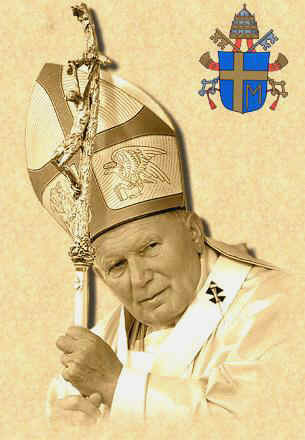 In 1964 Wojtyla became archbishop of Kraków and in 1967 a cardinal. An active participant in the Second Vatican Council, he also represented Poland in five international bishops' synods between 1967 and 1977. John Paul II was elected pope on Oct. 16, 1978, succeeding John Paul I. On May 13, 1981, he was shot at close range and severely wounded in an assassination attempt as he entered Saint Peter's Square in the Vatican, but he made a full recovery. Pope John Paul II insisted doctors not remove his brown scapular during surgery on him following the assassination attempt in May 1981. Father Mariano Cera, a Carmelite priest, told Inside the Vatican: "Just before the Holy Father was operated on, he told the doctors 'Don't take off the scapular.' And the surgeons left it on." Pope John Paul was convinced that Our Lady of Mount Carmel, along with Our Lady of Fatima, saved him from the bullets of Mehmet Ali Agca. The pontiff, a Secular Order Carmelite, has worn the scapular of Our Lady of Mount Carmel since he was a young boy. He frequently asks Our Lady of Mount Carmel to help him make important decisions. Throughout the 1980s and '90s, John Paul II dealt forcefully with dissent within the church, reaffirming Roman Catholic teachings about homosexuality, abortion, artificial methods of human reproduction and birth control, and priestly celibacy. He resisted secularization in the church, although he endorsed the use of modern technologies such as the Internet to spread the church's messages. In redefining the responsibilities of laity, priests, and religious orders, he rejected ordination of women as priests and opposed direct political participation and office holding by priests. His initial ecumenical moves were toward Eastern Orthodoxy and Anglicanism, but his greatest achievement came on Oct. 31, 1999, when Catholics and Lutherans signed, at Augsburg, Germany, an accord ending the dispute over the doctrine of justification which sparked the Protestant Reformation 482 years earlier. During the same period, he also contributed to the restoration of democracy and religious freedom throughout the Eastern European Communist countries, especially in his native Poland, and made numerous journeys, including those to Africa, Asia, and the Americas. Despite recurrent health problems in the 1990s, John Paul maintained an active schedule. In September 1993 he traveled to the Baltic republics, the first papal visit to countries of the former Soviet Union. His journey to Lebanon in May 1997, to give his support to the Christian minority and to heal religious divisions there, was followed by a visit to Brazil in October. On a five-day visit to Cuba in January 1998, he denounced U.S. trade sanctions against that country and pressed Fidel Castro's government to release political prisoners and ease restrictions on religious and political rights. He also pressed Nigeria on human rights issues during a three-day visit two months later; while there, John Paul beatified a Nigerian priest. Emphasizing a central theme of John Paul's papacy, that of Jewish-Christian reconciliation, the Vatican issued a statement in mid-March apologizing to Jews for the Church's failure to take decisive action against Nazi Germany; the document received a mixed reception from Jewish groups, in part because it defended the actions of Pope Pius XII during the Holocaust. Concerned with the mission of Roman Catholicism in the Americas and the problem of increased Protestant proselytism in Latin America, the pope visited Saint Louis, Mo., and Mexico City in January 1999. In June of that year, in the spirit of strengthening ties with the Orthodox church, the pope traveled to Bucharest, Romania, his first visit to a country where Orthodox Christians formed a majority, and, in November, to the former Soviet republic of Georgia. Also in November, the pope's second visit to India (the first was in 1986) marked his efforts to find a solution to the rising tensions between Hindus and Christians. Another solution for solving temporary problems with money is here. Fulfilling the promise of his apostolic letter Tertio Millennio adveniente (As the Third Millennium Draws Near, 1994), John Paul greeted the year 2000, which he proclaimed the year of the Great Jubilee, with a series of epoch-making activities calling for dialogue and brotherhood among the faiths. In February of that year, John Paul was the first pope to travel to Egypt, where he celebrated a mass in Cairo, touching on discrimination against Christians (see Coptic Church) in Egypt and other countries of Africa. In March, on Ash Wednesday and on the first Sunday of Lent, at Saint Peter's Basilica, John Paul emphasized the millennial theme of "purification of memory" by offering apologies for sins committed in the service of truth and sins committed against Jews, women, indigenous peoples, the unborn, and other groups. Later that month, on a pilgrimage to the Holy Land, he visited sites sacred to Christians, Muslims, and Jews, and brought his message of peace and reconciliation to Israeli and Palestinian leaders. In September he celebrated the beatification of two of his predecessors in the papacy, Pius IX and John XXIII. In May 2001, John Paul made a pilgrimage to Greece, Syria, and Malta, seeking to follow in the footsteps of Saint Paul the apostle and to continue his appeal for reconciliation among churches. The controversial trip to Greece was the first by any pope since the Great Schism of 1054 divided Christianity into Western and Eastern branchesthe Roman Catholic Church and the Orthodox Church. In an address to Greece's Orthodox leader, Archbishop Christodoulos (1939 ), the pope asked God to forgive Catholics for past and present sins committed against Orthodox Christians; the pope specifically mentioned the pillaging of the Orthodox Church's chief city, Constantinople, now Istanbul, by Crusaders in 1204. In Syria, where the overwhelming majority of the population is Muslim, John Paul became the first pope to enter a mosque; he marked the historic event by issuing a plea for mutual forgiveness between Christians and Muslims. On the eve of the pope's 83d birthday, in May 2003, the Vatican publicly acknowledged for the first time that he was suffering from Parkinson's disease, a disabling neurological disorder that, along with other ailments, made it difficult for him to stand or walk. Despite these infirmities, in June he made an unprecedented 100th foreign journey, a five-day pilgrimage to Croatia. Since becoming pope, John Paul has visited more than 200 countries and territories. John Paul's first encyclical letter, Redemptor Hominis (Redeemer of Man, 1979), probes the connection between redemption by Christ and human dignity. Subsequent encyclicals have dealt with the power of mercy in human life (1980); the importance of work as a "way of sanctification" (1981); the position of the church in Eastern Europe (1985); the fallacies of Marxism, materialism, and atheism (1986); the role of the Virgin Mary as a source of Christian unity (1987); the destructive effects of superpower rivalry (1988); the need to reconcile capitalism with social justice (1991); the need to preserve the traditional Christian values of truth and morality as one entity (1993); reiteration of teachings about abortion, euthanasia, and capital punishment (1995); a plea for an end to the separation of faith and reason (1998); and the importance of the Eucharist (2003). John Paul has published poetry and, under the pseudonym Andrzej Jawien, a play, The Jeweler's Shop (1960). His extensive ethical and theological writings include Love and Responsibility (1960); and Fruitful and Responsible Love and Sign of Contradictionboth published in 1979. His memoirs include Crossing the Threshold of Hope (1994) and Gift and Mystery: On the Fiftieth Anniversary of My Priestly Ordination (1996). A recording of the pope reciting and singing psalms in a variety of musical settings was issued in 1999 on the compact disc, Abba Pater, meaning "father" in Aramaic (abba) and Latin (pater). His book, Memory and Identity: Conversations Between the Millenniums, was published in early 2005. In the light of Christ risen from the dead, on April 2, 2005, at 9.37 p.m., while Saturday was drawing to a close and the Lord's Day was already beginning, the Octave of Easter and Divine Mercy Sunday, the Church's beloved Pastor, John Paul II, departed this world for the Father. What is Pope John Paul II's affiliation with the Carmelites?